The range of options for those wishing to marry in church has been increased by a change in the law, and it may now be possible for some couples to marry in St Augustine’s even if they do not live in the parish. An idea of those who are eligible can be gained from this page of the Church of England’s very informative Your Church Wedding web site. 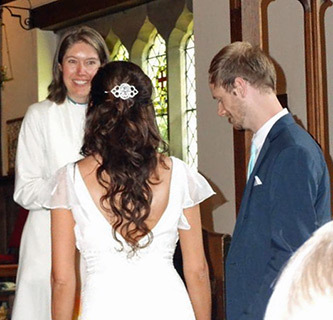 If you think you may be able to get married here, but want to know all the details for sure, please do get in touch with the Reverend Lisa Barnett at The Vicarage, Vicarage Lane, Scaynes Hill. Alternatively, you could contact her by e-mail at revlisa@sash.org.uk. The diocesan banns application form is a rather large download, particularly in rich text format, which can be read using a number of word-processing packages, such as Microsoft Word or Wordpad in Windows,. We recommend that you download the portable document format version, which can be read using the freely available Adobe Reader, if at all possible, especially as the rtf document expects to find the CG Omega font installed upon the computer, and may substitute an unpredictably different font if this is not found. The completed form should be returned to Reverend Lisa Barnett at the Vicarage, Vicarage Lane, Scaynes Hill. This page was last edited on Wednesday 17th October 2018 at 23:09:07 GMT, and was last fetched from the server, which is running FreeBSD 11.2-RELEASE-p9, on Friday 26th April 2019 at 00:45:24 GMT.